We thought we'd push it hard today, get a few miles under the bottom and all that, so we were up at the crack of nine, in what was almost brilliant sunshine, and even more brilliantly, with barely a few kilometres travelled, spring turned up for an hour or so and what a difference that made to the world! The forecast did suggest that this little spurt of sunshine was but an omen for what may happen in a day or two's time and that getting excited about it might not be an appropriate behaviour, but we took what of it there was to take and happily smoked off into the morning, ready to provision the ship at our favourite provisioning spot, on the outskirts of Nancy. We really love that place, Nancy that is, not mooring along the back wall of the supermarket smelling more than ever of beer processed through kidneys, and we felt super guilty as we passed by the harbour trying not to take so much as a sideways glance. For the first time in three years, we have passed Nancy without spending a few days or even a week poking around it's squares and alleys, but we are determined to keep trucking on. A little further down the waterway, there is a harbour with pontoons that are covered by ducks. It's a place called Champignuelles and it would have won me a sheep station last year if Jacques had one to bet. That Jacques of "travelled every waterway in France and live just a bit up this one fame", like every other boat person in France it seems, did not know of the existence of this little harbour, despite it actually existing on the main channel a mere six kilometres from Nancy. 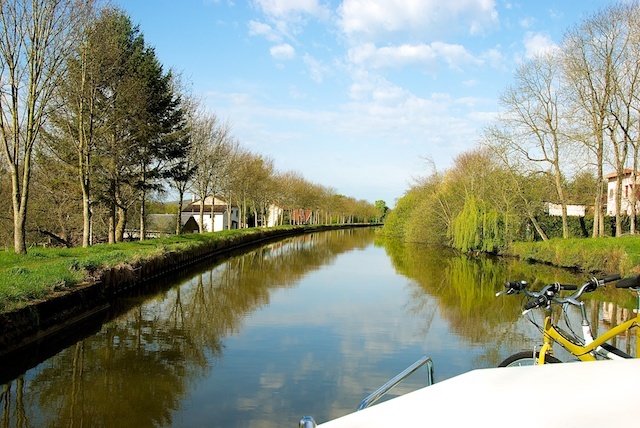 We like to stay there too, because it's free and very close to all sorts of facilities, and when we are people possessed with the urge to travel as fast as we are, it gives us a real head start to the main lock dropping us onto the Moselle, and our first gateway to what lies in the West. So after another arduous day at the helm and our larder filled with supplies that will last until the next supermarket, err… tomorrow, we are able to tick off another twenty or so kilometres in the log.